The Camelbak Charm was my first hydration pack. I bought it when I figured 1.5L would be the most I would need on a run (little did I realize how much I`d like 50kers!) and wanted a lightweight pack. At a price tag just shy of $50.00 it has paid for itself in spades. The Charm is very lightweight and easily accommodates the 1.5L bladder that is included with room to spare for a few gels and bars. The bottom of the pack has a small separate compartment that I can fit my Galaxy phone into along with some extra change if I need a pit stop. The shoulder straps are spaced far enough apart that chaffing has never been an issue. The sides have small, adjustable straps. No matter how tight I adjusted the straps though I`ve never been able to keep the shoulder straps in place as I run. So, I grab a Velcro reflective strap (purchased for $1.00 at the local Dollarama) and use that to give the front a chest strap. I`ve used this hydration pack on runs as long as 3 hours on every imaginable terrain (well, except a glacier or the desert). It moves with you as you run, although I won`t tell you there isn`t an adjustment period to hearing the swish, swish of the bladder. One solution I overhear at my last Ultra was to put the bladder in upside down, it totally kills that swish sound but you have to remember to flip it right side up once you get down to the last 25% - I`ve tried to get fluid up the hose but nearly gave myself an asthma attack in the process. Take a second and flip the bladder. I`ve used this pack to hold my work outfit on run commutes home and have even used the strap at the top of the bag to hold a light jacket-with no issues! This pack is perfect for a half marathon distance or less if you don`t want to refill the pack. I`ve recommended it for cycling as well since it sits low (and won`t interfere with a helmet) and you barely notice it`s on your back. I`ve owned this pack for 3 years and it still looks like it was bought yesterday. The bladder and hose is in excellent condition (I wash with soap and water and lay out to dry) and the pack itself gets thrown in the wash and let to air dry. I would recommend this to any woman looking to get the water bottles off her hips and have ``turn of the head`` access to water. More Space! In my last trail race I ran out of water and it really sucked. It was about 40 C and I started hallucinating. While I made it out fine I nearly drank a whole 2L of pop at the finish table. I know, I know, the heat was a big factor, but I`ve been in this situation a couple of times (minus the tree-cars-see my last race report) this summer and with my birthday coming up I figure it`s time to trade up a bit. 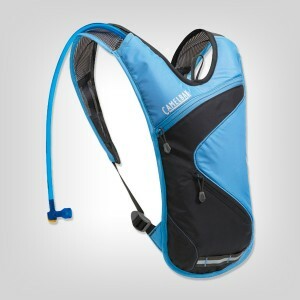 I`m currently waiting for my new pack to arrive (review to come soon) it holds 2L, with 2 bottle holders. I`m not sure if it will make its debut at the LOU52, I will need to test it out on a few long runs first. Stay tuned!